Antwerp – Engage, 1st Day: What an important announcement, there will be a free for non production use licence of the latest and greatest IBM Domino Server. No time bomb and the only limitation is the usage. The purpose of this licence is very simple: Developers of all kind and nature are getting access to the huge ecosystem of IBM Notes/Domino/XPages Application Development. With this announcement, a dream comes true: It’s about equality and same possibilities comparing with any other development platform. This removes the barriers for young students to choose IBM Domino as their developement platform. If you want to give Domino / XPages a try, here you are, no costs, no limits. Some may say – It’s too late! Probably yes, but the way how the world of app development has changed, to todays micro service focused way of doing things with containers and NodeJS in the middle of all thinking, would happen anyway. I believe it’s not too late. It is right on time: We have millions of Notes Applications out there, serving a good job to their users. Some of them need only some kind of a face lifting and a transformation to become a micro service. And of course, they should be accessible via Web browser and become integrable in today’s world. With the announcement, we are capable to get the right people on board to do this job. Because any application in today’s world that serves a good job to the business has a price less value, no matter how complex they are! And now think about this: There is a project out there on OpenNTF (called SmartNSF) to help you preserve the Business Logic of a Notes Application and expose it as a REST API. The “only” thing that has to be done is defining this API in a single file and building a new accurate Web UI! But even think more… This approach encapsulate your NSF to a micro service with a huge business value. But for this we need Developers with knowledge of IBM Domino and the market with this huge amount of Notes Application is big. Even companies which have left IBM Domino since years (to another mail platform) do have remaining applications. Rebuilding such applications from scratch is because of the amount of work and knowledge, the time and the available money nearly impossible! Why not transforming them to a micro service? OpenNTF is in the middle of his biggest transformation since the beginning. Core of the this transformation is building communities around visions, problems and projects. This needs communication…. Continious communication, a flow of questions, answers and ideas. But how to communicate continuously, several topic’s, restricted content, open content, and involving everybody who is interested to become a part of this community? I the middle of this storm of changing culture and using technology, Jesse discovers “by accident” slack. We (Jesse and I) decided to register openntf.slack.com, to get some experience and figure out if slack would help us. 2 weeks later, after some testing, which includes also the integration of our Atlassian suite, it was clear – a developers dream. Mulit channel / topic and content federation… how wonderful. But how to on board as many people as possible. At this point, Declan Lynch came on the plan and pointed to https://github.com/rauchg/slackin. A node.js project with an auto deploy to Heroku. But Heroku offers a free offering with 6h downtime in 24h. Sorry, not an option and to be honest, that has not looked like the next challenge I want to conquer. But Declan explained that this is a node.js app, it could also run on IBM Bluemix….. And YES I’ve a IBM Bluemix Account. But node.js? And how to give this “Slackin – Thing” some parameters during the startup? As a good conditioned Java Developer, my first step was to download the needed eclipse plugin. Go to IBM Bluemix, build a new Organisation and then create a node.js app. Not a boilerplate, only the runtime. …. And wow, IT WORKS. How cool is that. No Plan of node.js, using an OpenSource project from github, no installation of any server and the application is running in less than an hour. Okay thats definitely also a developers dream. 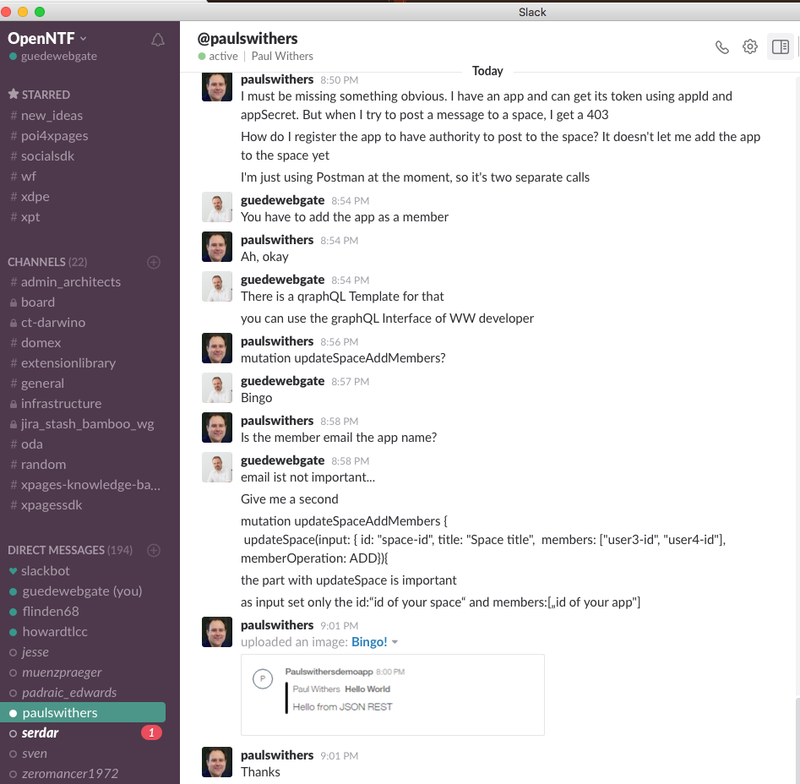 And now join openntf.slack.com and following the OpenNTF Community.